J.B. Pritzker, Juliana Stratton. 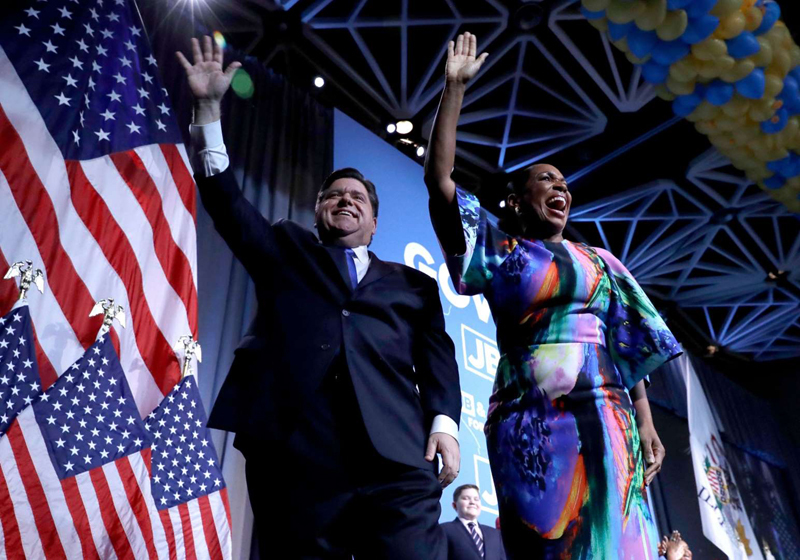 Democratic gubernatorial candidate J.B. Pritzker, left, and his running mate lt. governor candidate, Juliana Stratton, wave to supporters after Pritzker defeated incumbent Gov. Bruce Rauner in Chicago Election 2018 Governor Pritzker Illinois, Chicago, November 6, 2018. President Trump is no longer America’s richest politician. Billionaire Democrat Jay Robert ‘J.B.’ Pritzker just spent a record $171.5 million of his own money to become the next governor of Illinois – and America’s wealthiest plutocrat. The venture capitalist and Hyatt Hotel heir won 54% of the vote, defeating Republican incumbent Bruce Rauner – himself a private equity billionaire – by a 15-point margin. Rauner gambled nearly $60 million of his own fortune on the Illinois governor race; in total, the two billionaires personally spent almost $230 million. Former eBay and Hewlett-Packard Chief Executive Meg Whitman held the previous high for self-financing, after spending $144 million on her failed bid for California governor in 2010. Once he assumes office, Pritzker will be America’s richest sitting politician, according to Forbes and others, worth an estimated $3.2 billion. That means he will eclipse President Donald Trump, who previously held that title. Forbes currently estimates POTUS’ net worth at just $3.1 billion, down from $3.7 billion a year ago. Pritzker will be the richest governor in recent U.S. history, and the second-wealthiest U.S. politician to hold office – after former New York City Mayor Michael Bloomberg, who today has a net worth of $46.4 billion. Pritzker is not a self-made man. With total wealth of $33.5 billion, according to Bloomberg,the Pritzkers are the 15th richest family in America. J.B. is one of eleven billionaire heirs in the Pritzker clan today. His fortune stems from the Hyatt Hotel chain, which was founded by his uncle Jay in 1957 and run by his father, Donald, who served as its president. J.B. and his brother Anthony founded their own private equity firm in 1996, the Pritzker Group, which runs several industrial firms and has a stake in Elon Musk’s aerospace company SpaceX. Their sister Penny Pritzker, also a billionaire, served as Secretary of Commerce during the Obama Administration. Worth $2.7 billion today, Penny currently sits on the boards of companies like Microsoft and Measure, a drone startup. Before becoming Governor-Elect of Illinois, J.B. was a prominent supporter of the Democrats and a powerful fundraiser for the party. He spent over $14 million supporting Democrats in 2016, including then-candidate Hillary Clinton. And beyond the massive amounts he spent on his own campaign in 2018, J.B. contributed $661,000 to Democratic candidates and super PACs, according to Federal Election Commission data analyzed by Forbes. Are home warranties worth buying? Is Disney's 'Star Wars' Universe Imploding?